This lamp appeared in Christies June 1990 auction. 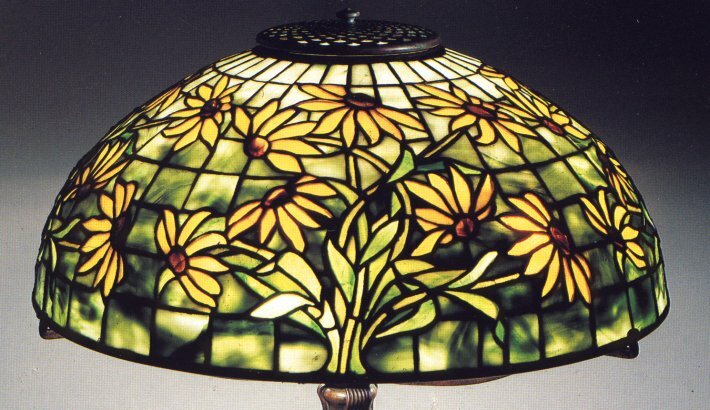 Four bunches of dark yellow blossoms with brown centers set against a mottled green-white geometric ground, the bronze base cast with scrolling tendrils and stylized pods, the shade stamped TIFFANY STUDIOS NEW YORK, the base stamped TIFFANY STUDIOS NEW YORK 26872. 21" high, 16" diameter of the shade.